Hope may seem like an ever-distant ideal playing hard-to-get (and winning) when you take a good, long look at the world today: children being seperated from their parents and kept in cages as families attempt to seek asylum in the US; racism sinking its teeth further into our everyday as victims like Antwon Rose, Trayvon Martin and Stephen Lawrence are on the rise; eyebrow-raising Brexit negotiation talks; and the choices resulting in housing construction disasters like Grenfell Tower. 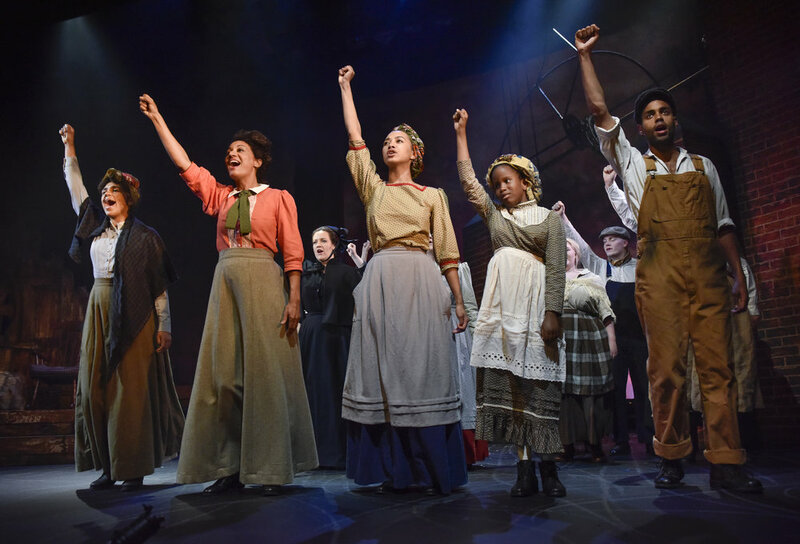 However, Ian Kershaw’s new musical ‘Bread & Roses’ *, directed by Amanda Huxtable, puts forward a different view as it winds the clock back to 1912 and jumps into a real-life story about a women-led mill workers strike against the injustice enforced by abusers of power. In the early hours of New Years in Lawrence, Massachusetts a hauntingly beautiful song sweeps through the multi-cultural town as its inhabitants begin to celebrate the end of 1911 and the start of a more promising 1912. And as word gets round that a law preventing women and children from working more than 54 hours a week has passed that day, things are looking ever so hopeful for Lucy-Rose Atkins, her daughter and her friends who are all mill workers. However, when they receive a pay notice some days later, it dawns on them that the mill owners have deducted the lost hours from their already-low pay making it much harder for them to put enough food on the table for their families than it already was. The workers are now faced with a choice: stand up for themselves and fight for what they deserve or kowtow to the whims of a government and economy stained by discrimination and oppression. 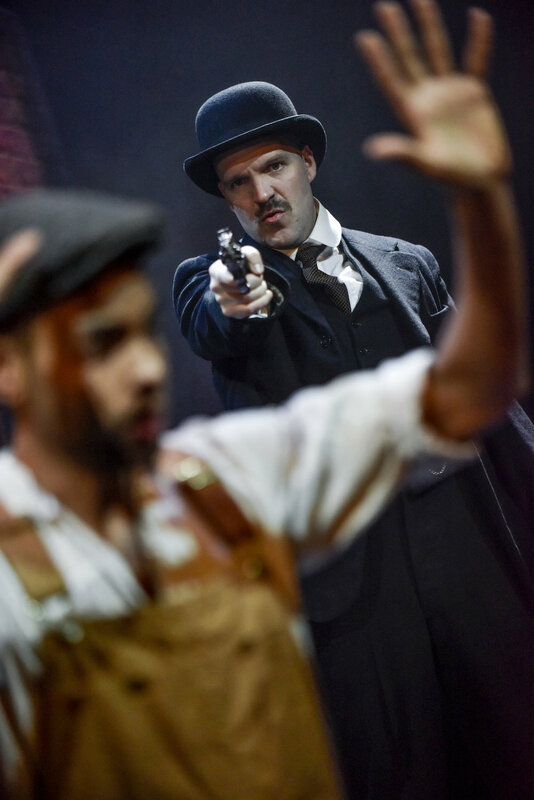 With the minimal but effective set designed by Kate Unwin mirroring how much the mill workers stretch what they have to meet their needs, the bewitching performances of the cast is left unhindered. Emma Naomi (The Cherry Orchard, Royal Exchange Theatre), Sophie Mercell (Let Me Play the Lion, The Barbican) and Tupele Dorgu (Barnum, Menier Chocolate Factory) portray their characters - the selfless Lucy-Rose Atkins, loyal Abbie Williams and driven Elizabeth Gurley Flynn - with a fieriness invoking trust as opposed to fear which is refreshing; Claire Burns (Pure/ Canary Girls, Mikron Theatre Company) and Lauryn Redding (Educating Rita, UK Tour) bring a certain sensitivity and warmth to their conflicted characters Anna LoPizzo and Martha Carter; and exploring the nuances of charm are Matthew Ganely (Around the World in Eighty Days, New Vic Theatre), Oliver Wellington (The Hundred and One Dalmatians, Birmingham Rep) and Rupert Hill (The Full Monty, David Pugh Ltd) with their characters William Dukes, Cal Jackson and Joe Ettor. Although it is slightly disheartening to think of how the echoes of the events that took place back then can still be heard and seen today, it is inspiring to be reminded of the power that resides in a group of people (regardless of race) who share a common goal especially when the audience is made to feel a part of the Industrial Workers of the World (IWW) community. Balancing education and entertainment beautifully, ‘Bread & Roses’ is a moving story about greed, hope, loss, love, power and self-acceptance that leaves little to no room for idle thoughts as it sheds light on the dire living and working conditions of the mill workers with humour and hope not too far behind. So if this sounds like the show for you, catch it before it ends on 7th July 2018.